We won. We got out of the EU. Well, we voted out of the EU. Actually leaving is yet to be seen. Nevertheless, we can somewhat, move our attention away from Mrs. Merkel and the Brady Bunch at Brussels, to other problems our nation faces. One of those problems we are facing, is the overreaching ‘Alliance’, that is NATO. After all, its purpose is dead, it’s extremely partisan, to the effect it is dangerous, and our forces would be very much better off without it. NATO’s, primary purpose, when made in 1949, was a one to stop the spread of International Socialism. That purpose, has now been defunct for the past 30 years. Communism lost when Ronald Reagan told Gorbachev to ‘tear down that wall’. Communism, as it was destined to, lost. The USSR crumbled and the Iron Curtin melted away. Therein lies the biggest fault of NATO. Now that its real purpose is lying dead on the floor of history, it has forced itself to make up new purposes to keep itself alive. These new purposes include: a one of hawkishness, to make the USA an all-powerful state, finding ‘Humanitarian’ causes to ‘fight’, and dropping democracy on those that have the right amount of oil. In the 90s, one of these ‘Humanitarian’ interventions, an oxymoron by the way, was their 78-day bombing raid, on Yugoslavia, during the Kosovo war. The bombing raids, dubbed ‘Operation Allied Force’ (a name that screams illegitimacy), killed over 2000 civilians. Including 88 children. Bombing Churches, and schools. Leaving the country massively in debt. Now, if Yugoslavia posed a threat, this can be seen as a casualty of war. Yugoslavia, however, had never posed any danger to NATO or its member states. The Kosovo war was an isolated event in Eastern Europe. NATO had no reason to take sides, and crush a country’s sovereignty in the name of ‘good will’. Then we have the ‘US Committee to Expand NATO’, formed in 1996. This was the collection of the very same people who made the ‘Project for a New American Century’, a think tank instrumental in helping drum up support for the oh, so successful war in Iraq, and to debase much of the west into a supposed ‘War on Terror’. This committee, filled to the brim with Neo-Conservatives, was designed to push NATO involvement with the world by expanding it to the Russian border. It is, American Exceptionalism in full force, with the Neo-Cons and the third way Clinton progressives, rallying up support for ever greater NATO involvement in the world. 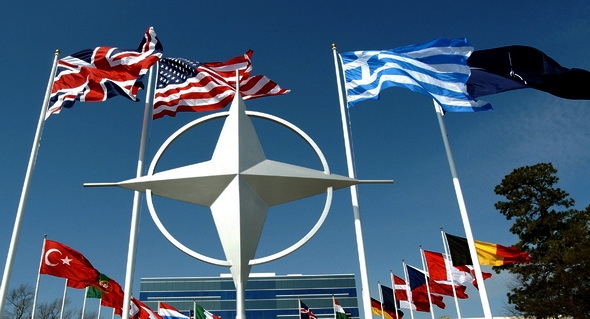 Greater involvement for NATO just means, greater involvement of the USA interests. This expansion of NATO is also used for another reason; it fits perfectly well for the Military Industry Complex. The president of the US Committee, a certain Bruce Jackson, also happened to be Vice President of Lockheed Martin, the biggest military contractor in the USA. Whenever a new nation joins NATO, as the Committee wanted, they are needed to reach ‘Uniform Standards of NATO’. Lockheed Martin is the first of these contractors used to reach NATO standards. NATO’s other main hobby is spiting hate at the former communist Russia and its leader Vladimir Putin. Putin and Russia are ‘resurgent and aggressive’. He is a danger and he must be stopped. Other than defending those in Ukraine, usually as a ploy to grow NATO borders ever closer to Russia, NATO is also considering of allowing Georgia to join, the tiny nation that had a brief war with Russia in 2008 in a seemingly asinine way to provoke Russia. These are Cold War tactics that should have ended in the 80s. Putin, is undoubtedly, a smart man. Judging by his handling of the Syrian crisis, he alone, is the one with the real foreign policy. He would never invade any country like our own. However, NATO just wants us, to fuel the fire onto our relations with Russia. Instead of that, Britain should be working with Russia for both of our nation’s best interests, we can’t do that while we remain a member of NATO. NATO’s natural enemy is Russian, and in the end NATO will suffer the consequences of this. I was very glad when Donald Trump declared that NATO is ‘obsolete’. He decreed that the USA should not be the ‘world’s policeman’. Arguing that NATO ‘doesn’t have the right countries in it for terrorism’. Trump argued for, an ‘America First’ foreign policy. Nobody should have been shocked, that NATO Generals came out and told us to stay in the EU. After all, they are mirror images. They are both outdated, overtly centralized, over funded, and outright corrupted. The EU and NATO reflect international interests, rather than the nations apart of it. We need a, to paraphrase Trump, a “UK First” foreign policy. A policy that is only acting out in the British public’s interest and safety. Instead of looking to start wars, British foreign policy should be about what is best for the nation. Not someone elses.